Star Wars 8 Teaser Trailer Description Leaks? Has some wayward soul drifting through 4Chan actually seen the teaser for Star Wars 8? Doubtful. But a description of this leaked trailer is raising some eyebrows, as certain aspects of it fall in line with previous rumors we've heard. None of what you are about to read has been confirmed by Disney nor Lucasfilm, and must be swallowed with a huge glass of MiraLAX. That said, there may be some big SPOILERS ahead, so read with caution. The first thing that will have some Star Wars fans turning up there nose at this, is that the video descriptor comes from Mike Zeroh, a popular Youtube presence who dabbles in spoilers and speculation, some of which is often very wrong. But as we know, the first Star Wars: The Last Jedi footage is going to screen at Star Wars Celebration in April, or so we've been told. Most believe this won't even be a proper trailer, but instead will be a sizzle reel. This latest rumor claims that both a teaser and a sizzle reel will be released. And that there is also a second trailer that features just a few more second of extra footage made specifically for attendees of Celebration, of which will be locked in a vault never to be seen again afterwards. The next scenes fall in line with a rumor we heard last week. They show Poe, Finn and Kelly Marie Tran's as yet unnamed character infiltrating what is believed to be a Super Star Destroyer dressed as First Order officers. The earlier rumors claimed that this part of the movie only features Finn and Tran as they set out to plant bombs on the massive spaceship. Carrie Fisher's General Leia comes in early, and hints at a shadow that is growing. This reportedly cuts to Supreme Leader Snoke stepping out of his own shadow. Matching up with some previous rumors, it is stated that Snoke is at least 8 ft tall, squashing the notion that he is actually small and diminutive like Yoda. He is said to be a practical effect, not CG, with an actor in costume. Does this mean Andy Serkis is playing the character in costume? That's something we haven't heard at this point. 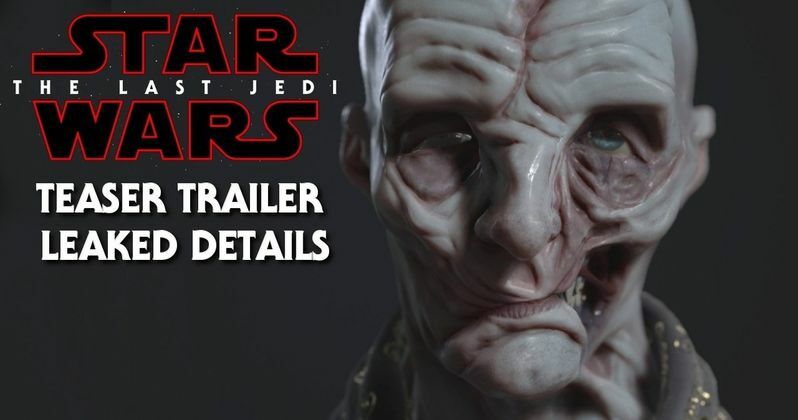 Or perhaps he's only voicing Snoke this time around? The leak goes onto claim that Luke Skywalker is largely absent from this first look sneak peek. But we do hear his voice near the end of the trailer, as his blue lightsaber shines off the armor of Captain Phasma. He says, "Everything will die with us". Mike Zeroh goes onto claim that the Celebration only trailer has three major Luke Skywalker moments. He says this. "The main teaser does not include Luke Skywalker and has far less money shots. The private teaser to be revealed to Celebration's attendees will get three great money shots of Luke Skywalker. One of which is him walking down the stone steps with Rey to some sort of tree."